Micropiles are 12-inch-diameter or less bored, grouted-in-place piles incorporating steel pipe (casing) and/or steel reinforcement. There has been a change in the code regarding micropiles and in this section I have covered all of these changes. Keep your eyes open for any details that pertain to your construction or building needs and as always ask your local building official to clarify any questions that you may have regarding this code. Micropiles must have a grouted section reinforced with steel pipe or steel reinforcing. Micropiles develop their load-carrying capacity through soil, bedrock, or a combination of soil and bedrock. The full length of the micropile must contain either a steel pipe or steel reinforcement. One of the materials used with micropiles is grout. Grout must have a 28-day specified compressive strength no less than 4,000 psi. As with all piles, micropiles too must be reinforced. For piles or portions of piles grouted inside a temporary or permanent casing or inside a hole drilled into bedrock, the steel pipe or reinforcement must be designed to carry at least 40 percent of the design compression load. A. 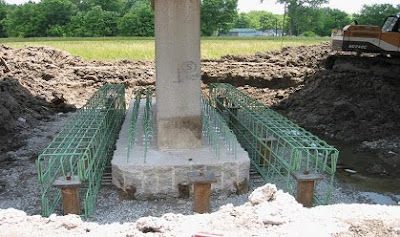 For piles grouted inside a temporary casing, the reinforcing steel must be inserted prior to withdrawal of the casing. B. The casing must be withdrawn in a controlled manner with the grout level maintained at the top of the pile to ensure that the grout completely fills the drill hole. C. Make sure you monitor the grout level inside the casing when you are withdrawing the casing so you can see that there is nothing obstructing the flow of the grout. D. You must verify the design diameter of the drill hole for a pile that is grouted in an open drill hole in soil without temporary casing. E. By using a suitable means for piles designed for end bearing you will be verifying that the bearing surface is properly cleaned prior to grouting. F. Subsequent piles cannot be drilled near piles that have been grouted until the grout has had enough time to harden. G. You must grout piles as soon as possible after you have completed drilling. H. For piles designed with casing full length, the casing must be pulled back to the top of the bond zone and reinserted to verify grout coverage outside the casing. Barcus solves unique problems such as Sheeting and Shoring, Pressure Grouting, Helical Foundation Anchors and other construction related problems. Where can I learn more about micropiles? I have heard about then through chat at my work but I would like to learn more so I can add input when they talk about it next time.